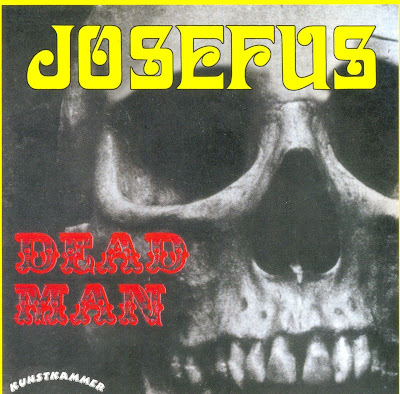 Emerging from the ashes of a band called United Gas in Houston, Josefus formed in September 1969. A couple of months later they attracted the attention of record producer Jim Musil, who invited them to Phoenix in Arizona to record under the name Come. However the deal he was negotiating with Straight Records did not materialise and the sessions remained unreleased until the Get Off My Case retrospective. The band reverted back to the name Josefus and returned to Houston. They went back to Phoenix, however, to record their 'first' album, Dead Man, which was recorded in just eight hours and mixed the next day. Comprising largely of originals it was probably their best work. It sold well in Texas and the highlight was the 17.5 minute title track. Two tracks from the album Crazy Man/Country Boy were also issued on as a single. Indeed the Dead Man release attracted the attention of Mainstream who signed them on a one album contract. The result was recorded at the Criteria Studios in Miami and produced by Bob Shad. This was in the same hard rock vein as their first effort but less imaginative and when neither the album or the 45 taken from it made any impression they split in December 1970. Pete Bailey and Ray Turner went on to play in a 1971 combo Stone Axe, together with guitarist Mike 'Wolf' Long and drummer Jerry Ontiverez. They had one 45, Snakebite on Rampart in the same year. Doug Tull later played for an outfit called Christopher and Pete and Dave Mitchell were involved in an EP by Guitar Orchestra issued on Home Cooking Records in 1976. In July 1978 Pete Bailey and Dave Mitchell reformed the band with a new line-up. This was short-lived but did make the two 1979 45s listed. In the nineties Get Off My Case appeared, which contains their first efforts recorded in December 1969 prior to Dead Man. It also has some different versions of songs that appeared on their first official album, including a lengthier version of Dead Man, Crazy Man and Situation. The release was accompanied by a booklet of the band's story. Thank you for this compliation, I had both records in vinyl and I wanted in flac. For me, the Texan psychedelia was the purest and darkest psych made ever, groups like The 13th floor elevators, Cold sun, Josefus, Golden down, The Buble puppy are the best sample of this.